If you are a keen and totally dedicated cyclist then a turbo trainer is an essential training tool when conditions outside are just too bad to get outdoors to ride. However, for many, indoor cycle trainers are a tool of torture and it can be difficult to get motivated to use them due to the boredom of sitting alone in your garage or lounge (or wherever you set yours up). This boredom issue has been resolved to some extent with the introduction of interactive turbo trainers and the software that goes along with them. In the past if you had an entry-level trainer you would be limited to watching videos while you cycled along, but as technology advances so do the possibilities. Now some newer solutions do not need a top-end interactive turbo trainer [AKA smart trainer] and you can instead use your standard trainer with some add on sensors. Here we provide an review / overview of best interactive turbo trainer software for 2017. We will dive deeper into a few of the most popular bits of software as well as provide a list of more that you can check out at you leisure. Zwift is hot at the moment and has received a lot of press over the last year or so. Zwift is considered to be one of the better turbo trainer software apps available because of its combination of being able to support many different turbo trainer types as well as having a great visuals and community riding options. Basically, Zwift allows you to ride virtual computer generated 3D routes on your laptop, computer or smart device. The harder you pedal the faster you go in the virtual environment. This is not unique to Zwift, as you will see below, however the ability to use many trainer types and therefore ride with more (real life) people is what makes Zwift particularly appealing. If you have an entry-level trainer with no clever electronics then you will need to get a cadence and speed sensor or a power meter to work with Zwift. Smart trainers such as those offered by Bkool, CycleOps, Elite, Wahoo, Tacx, Kinetic and Racemate can hook up to Zwift out of the box and what makes things really cool is that you can even vary the resistance you feel depending on the gradient of the hill you are climbing. Note that this only happens with compatible electromagnetic (or motor) turbo trainers. Bkool offer both hardware (i.e. turbo trainers) and software, with the software in particular advancing to a level that makes it something you must consider. Their software works on all major platforms, namely iOS, Android, PC and Mac. Also, their software is also compatible with a number of third party trainers as well as their own Bkool trainers, which is a real bonus. Like Zwift, the Bkool simulator (as it is known) lets you ride on 3D virtual worlds generated from real life locations, as well as letting you ride on videos of courses and on simple 2D maps if you choose to do so. Bkool let you import your own GPS data meaning you can re-ride your own routes in the simulator software and they will even generate a 3D world from your GPS routes. Additional features include multiplayer functions, including races & competitions, leagues and voice chat between players so you don’t necessarily need to ride solo. The software allows you to generate training plans so you can focus on your specific end goals such as endurance or hill climbing etc. 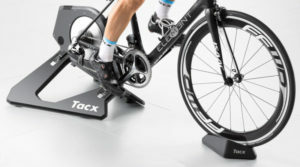 Tacx are very much a turbo trainer company and have a large range of excellent trainers. They also have some great software available on both smart devices and desktop computers. Tacx’s software works with all of their trainers as well as most third-party trainers that support the open ANT+ and Bluetooth BLE standards, however you will need to purchase a USB dongle to use the ANT+ option. An Android app is available for free but if you wish to use an iOS you will need a Wahoo dongle for use with an iPhone or iPad. The core functionality of the tablet app is its workout creator, allowing you to develop structured workouts based on grade or wattage. In addition, you are able to download (at a cost) high resolution online cycling course videos, and these videos are synced to GPS data so that if you have a compatible trainer its resistance will be automatically varied depending on the gradient of the route you are riding. The Tacx desktop app has far more functionality when compared to the tablet app. You can ride through courses created on Google Maps or you can use the virtual 3D environments available from Tacx. These 3D worlds are amazing quality as you can see in the video above. The video above tells it all. High octane video footage that puts you in the front line and really immerses you in the races. Many consider The Sufferfest the best cycling training videos currently available. They have hooked up with major cycling federations to bring official routes from the best and most famous pro racing events around the world. So you can now ride along and compete on the toughest races just like you see on TV (e.g. the Tour de France). The videos feature clear instructions as well as high-intensity interval workouts designed by world-class coaches, appealing to beginner and professional cyclists alike. The videos and training programs hook up with power meters, heart rate monitors and even smart trainers to make riding more realistic and rewarding (and useful). Virtual power is also an option if you do not have an expensive power meter. While TrainerRoad does not have the fancy 3D worlds to ride on or online races it has a number of advantages over comparable power-based workout apps. Firstly it supports a large number of different turbo trainer brands (i.e. it is not locked into a single type of trainer), and secondly, although it focuses on power-based workouts it actually does not require a power meter. TrainerRoad is a real training tool for serious cyclists. TrainerRoad works fantastically with power meters, so if you have one it is perfect, however if you do not have a power meter the app incorporates a ‘Virtual Power’ feature which allows it to interface with most trainers on the market. Using an ANT+ sensor, the ‘Virtual Power’ feature estimates power then broadcasts the signal using TrainerRoad’s ‘Power Relay Feature’ to easily record your readings on an ANT+ compatible bike computer. There is a massive library of workouts available through TrainerRoads numerous video partnerships so there are no shortage of courses or interesting topologies that you can ride during those long, cold winter hours. If you own a smart (resistance controlled) trainer then as you ride your resistance will be automatically varied to match the gradients you are climbing. Kurt Kinetic are a major turbo trainer brand with some pretty innovative products, such as the Rock and Roll turbo trainer. While their trainers are compatible with other software such as Zwift and TrainerRoad, Kinetic also have their custom Kinetic Fit app specially developed to run with their trainers. There are different tiers to the app ranging from free to $15 per month that include features such as complete training plans, power and heart rate zones, fully customizable displays, competitions and challenges. There is even the option to bolt on a Sufferfest package to gain access to all the Sufferfest videos. Kinetic have essentially developed a software suite from scratch so that is it perfect for their Kinetic turbo trainers. There are always benefits to having a hardware and software package so if you own a Kurt Kinetic turbo trainer you should check out the Kinetic Fit app. Which turbo trainer software is best for you? Here we focus on just a few of the very best software to use with your turbo trainer. The comprehensive list below lets you browse the many options available to you, but Zwift, Bkool, Tacx, Sufferfest, TrainerRoad, and Kinetic are the ones you should definitely check out first. If you want a visually beautiful riding experience and want to be part of a community then Zwift, Bkool, and Tacx are the ones for you, but if you are more about the training metrics and workouts then consider TrainerRoad and Kinetic Fit. The Sufferfest are massively popular and if you check out their ever expanding videos you can see why. Here we featured just one example of a Sufferfest video that immerses you in a real life racing situation, but there are many more for you to choose from.